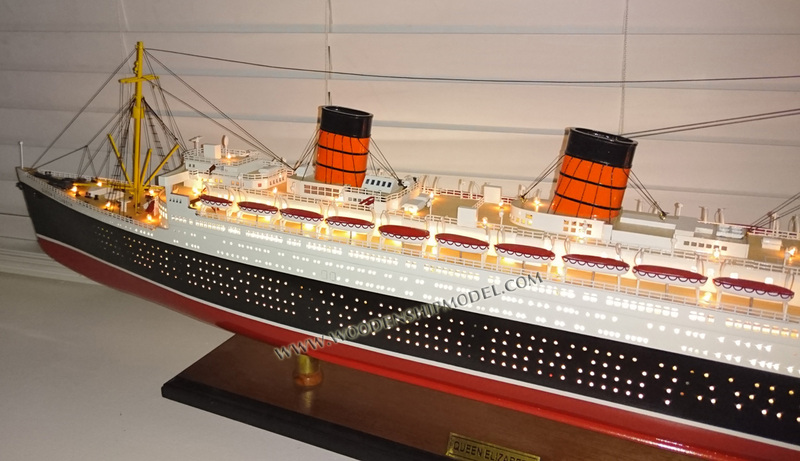 RMS Queen Elizabeth was an ocean liner operated by the Cunard Line. With her running mate Queen Mary, she provided luxury liner service between Southampton, the United Kingdom, and New York City, the United States, via Cherbourg, France. She was also contracted for over twenty years to carry the Royal Mail as the second half of the two ships' weekly express service. While being constructed, in the mid-1930s by John Brown and Company at Clydebank, Scotland, she was known as Hull 552 but when launched, on 27 September 1938, she was named in honour of Queen Elizabeth, who was then Queen Consort to King George VI and in 1952 became the Queen Mother. 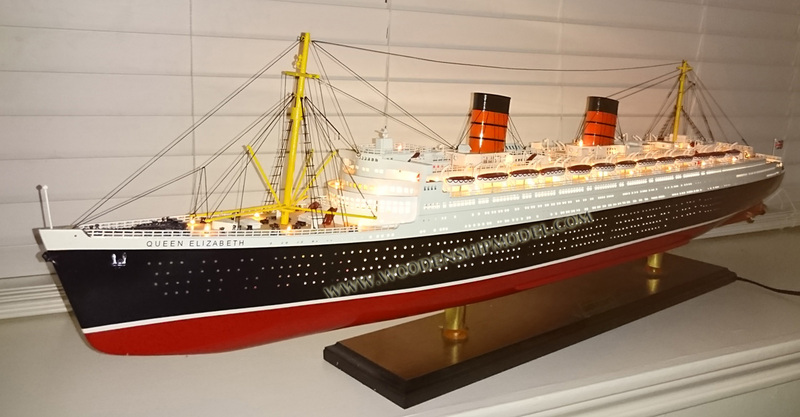 With a design that improved upon that of Queen Mary, Queen Elizabeth was a slightly larger ship, the largest passenger liner ever built at that time and for fifty-six years thereafter. She also has the distinction of being the largest-ever riveted ship by gross tonnage. 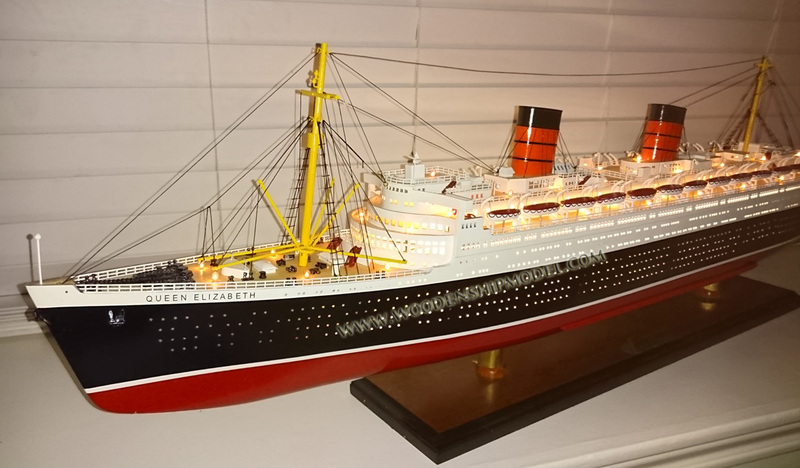 She first entered service in February 1940 as a troopship in World War II, and it was not until October 1946 that she served in her intended role as an ocean liner. 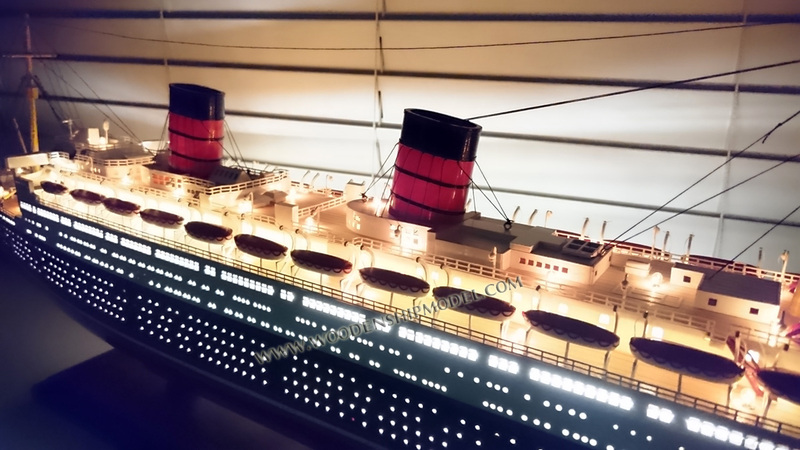 On the day RMS Queen Mary sailed on her maiden voyage, Cunard's chairman, Sir Percy Bates, informed his ship designers that it was time to start designing the planned second ship known as Hull 552. The official contract between Cunard and government financiers was signed on 6 October 1936. The new ship improved upon the design of Queen Mary with sufficient changes, including a reduction in the number of boilers to twelve instead of Mary '​s twenty-four, that the designers could discard one funnel and increase deck, cargo and passenger space. The two funnels were braced internally to give a cleaner looking appearance while the forward well deck was omitted, a more refined hull shape was achieved and a sharper, raked bow was added for a third bow-anchor point, so that she was ten feet longer than the older ship. Queen Elizabeth was built on slipway four at John Brown & Company in Clydebank, Scotland. During her construction she was more commonly known by her shipyard number, Hull 552. The interiors were designed by a team of artists headed by the architect George Grey Wornum. Cunard's plan was for the ship to be launched in September 1938, with fitting out intended to be complete for the ship to enter service in the spring of 1940. The Queen herself performed the launching ceremony on 27 September 1938 and the ship was sent for fitting out. It was announced that on 23 August 1939 the King and Queen were to visit the ship and tour the engine room and 24 April 1940 was to be the proposed date of her maiden voyage. Due to the outbreak of World War II, these two dates were postponed. Queen Elizabeth sat at the fitting-out dock at the shipyard in her Cunard colours until 2 November 1939, when the Ministry of Shipping issued special licences to declare her seaworthy. On 29 December her engines were tested for the first time, running from 0900 to 1600 with the propellers disconnected to monitor her oil and steam operating temperatures and pressures. Two months later Cunard received a letter from Winston Churchill, then First Lord of the Admiralty, ordering the ship to leave Clydeside as soon as possible and "to keep away from the British Isles as long as the order was in force". At the start of World War II, it was decided that as Queen Elizabeth was so vital to the war effort that she could not have her movements tracked by German spies operating in the Clydebank area. Therefore, an elaborate ruse was fabricated involving her sailing to Southampton to complete her fitting out. Another factor prompting Queen Elizabeth '​s departure was the necessity to clear the fitting out berth at the shipyard for the battleship HMS Duke of York, which was in need of its final fitting-out. Only the berth at John Brown could accommodate the King George V-class battleship's needs. One major factor that limited the ship's secret departure date was that there were only two spring tides that year that would see the water level high enough for Queen Elizabeth to leave the Clydebank shipyard, and German intelligence were aware of this fact. A minimal crew of four hundred were assigned for the trip; most were signed up for a short voyage to Southampton from Aquitania. Parts were shipped to Southampton, and preparations were made to drydock the new liner when she arrived. The names of Brown's shipyard employees were booked to local hotels in Southampton to give a false trail of information and Captain John Townley was appointed as her first master. Townley had previously commanded Aquitania on one voyage, and several of Cunard's smaller vessels before that. Townley and his hastily signed-on crew of four hundred Cunard personnel were told by a Cunard representative before they left to pack for a voyage where they could be away from home for up to six months. By the beginning of March 1940, Queen Elizabeth was ready for her secret voyage. Her Cunard colours were painted over with battleship grey, and on the morning of 3 March she quietly left her moorings in the Clyde where she proceeded out of the river and sailed further on down the coast where she was met by the King's Messenger, who presented sealed orders directly to the captain. Whilst waiting for the messenger the ship was refuelled, adjustments to the ships compass and some final testing of the ship equipment was carried out before she sailed to her secret destination. Captain Townley discovered that he was to take the untested vessel directly to New York without stopping, without dropping off the Southampton harbour pilot who had embarked on Queen Elizabeth from Clydebank and to maintain strict radio silence. Later that day at the time when she was due to arrive at Southampton, the city was bombed by the Luftwaffe. After a crossing taking six days, Queen Elizabeth had zigzagged her way across the Atlantic at an average speed of 26 knots avoiding Germany's U-boats, where she arrived safely at New York and found herself moored alongside both Queen Mary and the French Line's Normandie. This would be the only time all three of the world's largest liners would be berthed together. Captain Townley received two telegrams on his arrival in New York, one from his wife congratulating him and the other was from the ship's namesake – Her Majesty Queen Elizabeth, who thanked him for safe delivery of the ship that was named for her. 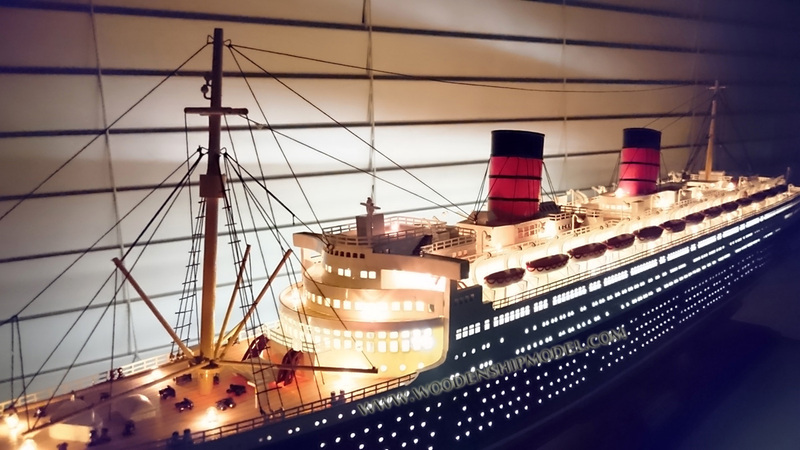 The ship was then moored for the first time alongside Queen Mary and she was then secured so that no one could board her without prior permission. This included port officials. Cunard later issued a statement that it had been decided that due to the global circumstances, it was best that the new liner was moved to a neutral location and that during that voyage the ship had carried no passengers or cargo. Queen Elizabeth left the port of New York on 13 November 1940 for Singapore to receive her troopship conversion. After two stops to refuel and replenish her stores in Trinidad and Cape Town, she arrived in Singapore's Naval Docks where she was fitted with anti-aircraft guns, and her hull repainted black, although her superstructure remained grey. As a troopship, Queen Elizabeth left Singapore on 11 February, and initially she carried Australian troops to operating theatres in Asia and Africa. After 1942, the two Queens were relocated to the North Atlantic for the transportation of American troops to Europe. Queen Elizabeth and Queen Mary were used as troop transports during the war. Their high speeds allowed them to outrun hazards, foremostly German U-boats, allowing them to typically travel without a convoy. During her war service as a troopship Queen Elizabeth carried more than 750,000 troops, and she also sailed some 500,000 miles (800,000 km). Her captains during this period were the aforementioned John Townley, Ernest Fall, Cyril Gordon Illinsworth, Charles Ford, and James Bisset. Following the end of World War II, her running mate Queen Mary remained in her wartime role and grey appearance, except for her funnels, which were repainted in the company's colours. For another year she did military service, returning troops and G.I. brides to the United States. Queen Elizabeth, meanwhile, was refitted and furnished as an ocean liner at the Firth of Clyde Drydock in Greenock by the John Brown Shipyard. Six years of war service had never permitted the formal sea trials to take place, and these were now finally undertaken. Under the command of Commodore Sir James Bisset the ship travelled to the Isle of Arran and her trials were carried out. Onboard was the ship's namesake Queen Elizabeth and her two daughters, the princesses Elizabeth and Margaret. During the trials, her majesty Queen Elizabeth took the wheel for a brief time and the two young princesses recorded the two measured runs with stopwatches that they had been given for the occasion. Bisset was under strict instructions from Sir Percy Bates, who was also aboard the trials, that all that was required from the ship was two measured runs of no more than thirty knots and that she was not permitted to attempt to attain a higher speed record than Queen Mary. After her trials Queen Elizabeth finally entered Cunard White Star's two ship weekly service to New York. Despite similar specifications to her older sister Queen Mary, Elizabeth never held the Blue Riband, as Cunard White Star chairman Sir Percy Bates requested that the two ships not try to compete against one another. In 1955 during an annual overhaul at Southampton, England, Queen Elizabeth was fitted with underwater fin stabilizers to smooth the ride in rough seas. Two fins were fitted on each side of the hull. The fins were retractable into the hull to save fuel in smooth seas and for docking. In 1959, the ship made an appearance in the British satirical Eastman Color comedy film The Mouse That Roared starring Peter Sellers and Jean Seberg. While a troupe of invading men from a fictional European country cross the Atlantic to 'war' with the United States on a tow boat, they meet and pass the far larger Queen Elizabeth, and learn that New York City is closed due to an air raid drill. The men on the tow boat respond by loosing arrows at the two officers speaking from near the ocean liner's bridge. The ship ran aground on a sandbank off Southampton on 14 April 1947, and was re-floated the following day. On 29 July 1959, she was in a collision with the American cargo ship American Hunter in foggy conditions in New York Harbour and was holed above the waterline. Together with the Queen Mary, and in competition with SS United States, the Queen Elizabeth dominated the transatlantic passenger trade until their fortunes began to decline with the advent of the faster and more economical jet airliner in the late 1950s; As passenger numbers declined, the Queens became uneconomic to operate in the face of rising fuel and labour costs. For a short time, the Queen Elizabeth (now under the command of Commodore Geoffrey Trippleton Marr) attempted a dual role in order to become more profitable; when not plying her usual transatlantic route, which she now alternated in her sailings with the French Line's SS France, the ship cruised between New York and Nassau. For this new tropical purpose, the ship received a major refit in 1965, with a new lido deck added to her aft section, enhanced air conditioning, and an outdoor swimming pool. 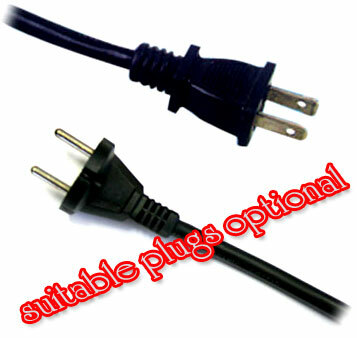 With these improvements, Cunard intended to keep the ship in operation until at least the middle 1970s. However, this strategy did not prove successful due to her high fuel costs, deep draught (which prevented her from entering various island ports), and great width, preventing her from using the Panama Canal. 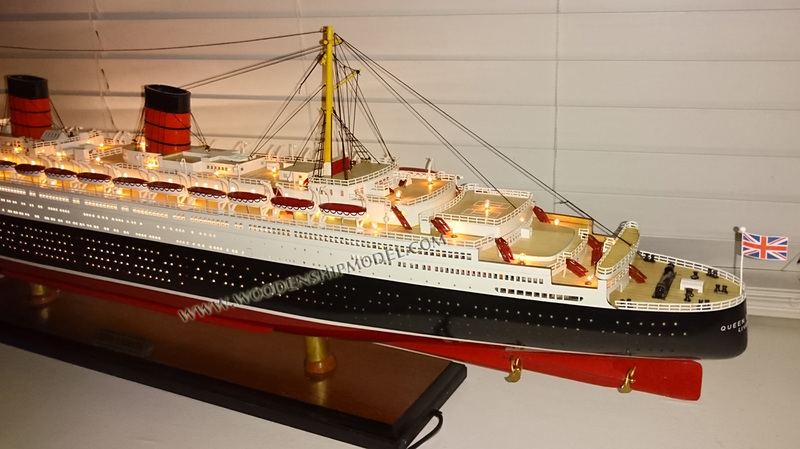 Cunard retired both ships by 1969 and replaced them with a single, smaller ship, the more economical Queen Elizabeth 2. In 1968, Queen Elizabeth was sold to a group of American businessmen from a company called The Queen Corporation (which was 85% owned by Cunard and 15% by them), at the same time the ship's name was also altered as Cunard removed the word "Queen" from the bow and stern. 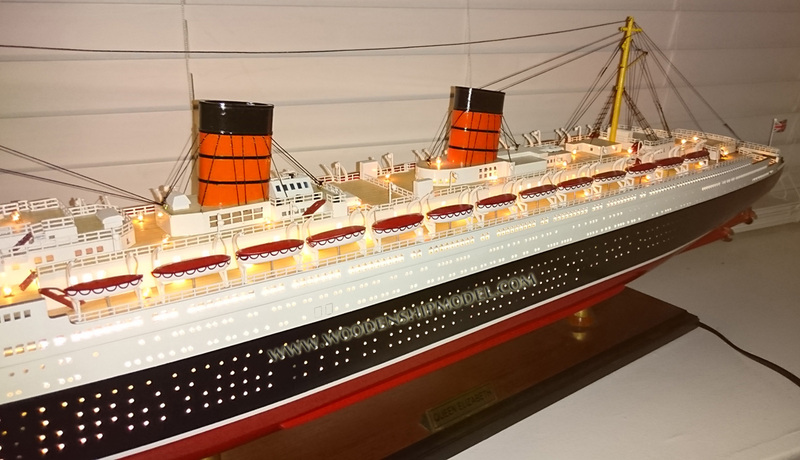 The new company intended to operate the ship as a hotel and tourist attraction in Port Everglades, Florida, similar to the use of Queen Mary in Long Beach, California. The Elizabeth, as it was now called, actually opened to tourists before the Queen Mary (which opened in 1971) but it was not to last. The climate of southern Florida was much harder on the Queen Elizabeth than the climate of southern California was on the Queen Mary. Losing money and forced to close after being declared a fire hazard, the ship was sold at auction in 1970 to Hong Kong tycoon C.Y. Tung. Tung, head of the Orient Overseas Line, intended to convert the vessel into a university for the World Campus Afloat program (later reformed and renamed as Semester at Sea). Following the tradition of the Orient Overseas Line, the ship was renamed Seawise University, as a play on Tung's initials. Near the completion of the £5 million conversion, the vessel caught fire on 9 January 1972. There is some suspicion that the fires were set deliberately, as several blazes broke out simultaneously throughout the ship. The fact that C.Y. Tung had acquired the vessel for $3.5 million, and had insured it for $8 million, led some to speculate that the inferno was part of a fraud to collect on the insurance claim. Others speculated that the fires were the result of a conflict between Tung, a Chinese Nationalist, and Communist-dominated ship construction unions. The ship was completely destroyed by the fire, and the water sprayed on her by fireboats caused the burnt wreck to capsize and sink in Hong Kong Victoria Harbour. The vessel was finally declared a shipping hazard and dismantled for scrap between 1974 and 1975. Portions of the hull that were not salvaged were left at the bottom of the bay. The keel and boilers remained at the bottom of the harbour and the area was marked as "Foul" on local sea charts warning ships not to try to anchor there. It is estimated that around 40–50% of the wreck was still on the seabed. In the late 1990s, the final remains of the wreck were buried during land reclamation for the construction of Container Terminal 9. Position of wreck: 22°19.717′N 114°06.733′E The Queen Elizabeth is surpassed only by the Costa Concordia in 2012 as the largest passenger shipwreck. The charred wreck was featured in the 1974 James Bond film The Man with the Golden Gun, as a covert headquarters for MI6. After the fire, Tung had one of the liner's anchors and the metal letters "Q" and "E" from the name on the bow placed in front of the office building at Del Amo Fashion Center in Torrance, California, US that was intended to be the headquarters of the Seawise University venture, where they remain to this day. Two of the ship's fire warning system brass plaques were recovered by a dredger and these are now on display at The Aberdeen Boat Club in Hong Kong within a display area about the ship. The charred remnants of her last ensign were cut from the flag pole and framed in 1972, and still adorn the wall of the officers' mess of marine police HQ in Hong Kong. Parker Pen Company produced a special edition of 5,000 pens made from material recovered from the wreck in a presentation box and these are highly collectable. Following the demise of Queen Elizabeth, the largest passenger ship in active service became SS France, which was longer but had less tonnage than the Cunard liner.